This update is not meant to debate again the ivory ban. The article below from thedodo.com is offered as an edited unbiased status report of what's happening. Our blog will continue to cover this in the coming months as we have in previous issues of the Newsletter. In February, Vermont introduced a key measure to completely ban its domestic elephant ivory and rhinoceros horn commerce, joining nearly 20 states taking action to eliminate the ivory trade in 2015. 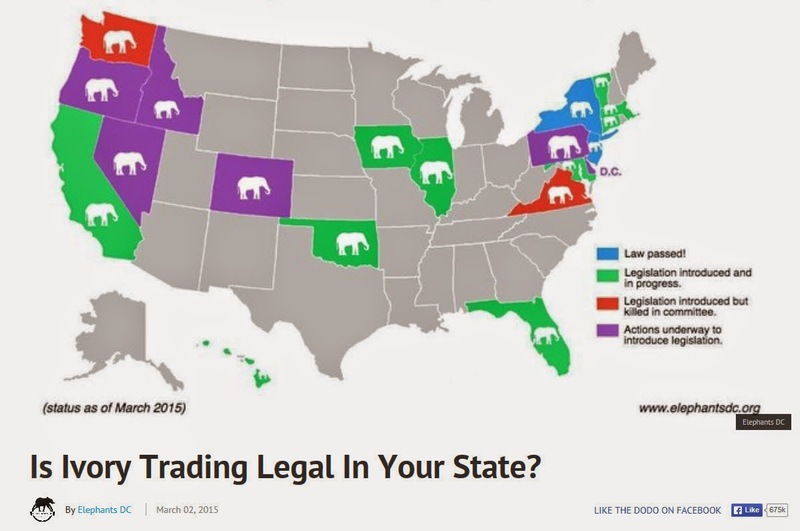 As of March 1, a plethora of diverse states — including California, Vermont, Illinois, Massachusetts, Hawaii, Florida, Oklahoma, Virginia, Maryland, Washington State, Iowa and Connecticut — have all introduced similar measures to end ivory and rhino horn trade in 2015. In addition, action is underway to introduce ivory sales bans in Colorado, Nevada, Idaho, Oregon, Pennsylvania, Delaware and the District of Columbia.